Keep Bad Astronomy close to your heart, and help make me filthy rich. Hey, it's either this or one of those really irritating PayPal donation buttons here. One of the wonderful aspects of the 'net is the ability to get people in contact with one another. This feature is exploited very well by the people at the Mad Scientist Network. They have collected many scientists from around the world and let them answer questions by anyone who has one, including everyone from grammar school children to adult professionals. I have been with them for quite some time now and have enjoyed answering questions about astronomy. Below are links to the answers I have given since 1996. Please note that the people that ask these questions vary greatly in age. I have tried to set the level of my answer appropriately; I would not want to use algebra to explain something to a kindergartener, or talk about clapping your hands to make sound to a graduate student! The age of the questioner is in the header of each post. According the to search engine at the Mad Scientist's lair, I have answered about 100 questions since 1996. So to break it up a bit, I will organize them into separate pages for each year. A new feature at the Mad Scientist Network lets you search for questions I have answered. This will take you to the MSN site. I made the Mad Scientists Hall of Fame! In 96 and 97 I went on a tear of answering questions, quite a few from outside my declared astronomy discipline, and so they stuck me in the Hall. I am honored, and of course, quite Mad. 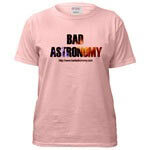 Subscribe to the Bad Astronomy Newsletter! Talk about Bad Astronomy on the BA Bulletin Board!